Lush, heartfelt, and elegant, At the Movies finds smooth jazz saxophonist Dave Koz celebrating his favorite movie themes. Featured here are such classic movie melodies as “Over the Rainbow,” “The Shadow of Your Smile,” and “The Pink Panther” as well as more contemporary songs like “A Whole New World” and the main theme from Schindler’s List. Showcased beautifully throughout At the Movies is Koz’s deftly melodic and supple saxophone sound, which truly evinces his obvious love of film and film music. It also doesn’t hurt that he’s often backed by a full orchestra and big band here, adding to the widescreen, cinematic sound he’s going for. Also engaging are Koz’s guest artist choices, including trumpeter Chris Botti, vocalists Johnny Mathis, Barry Manilow, Donna Summer, and others. 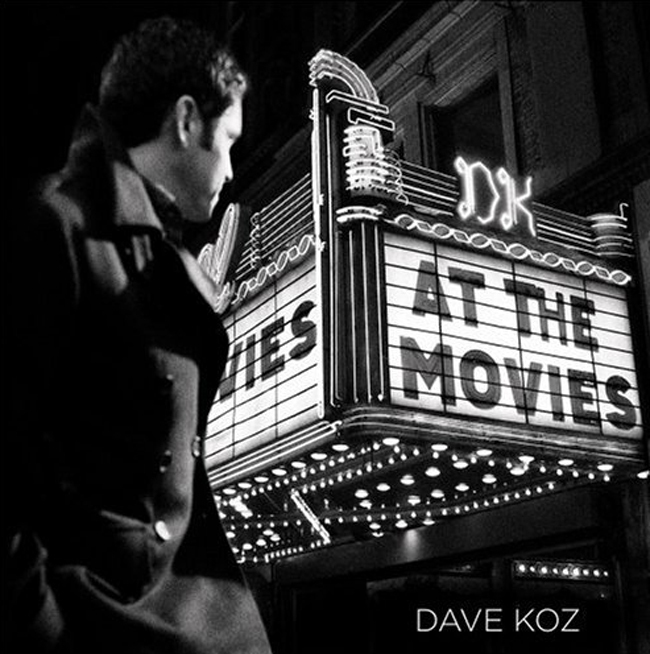 Dave Koz has created a great salute to songs from the movies that is fresh in it’s approach, pays tribue to the songs, and gives them a unque updated vibe. It kicks off with one of the most famous movie thme songs ever, and considering that Over The Rainbow has been covered by countless singers, it is appropriate that here we have a smooth instrumental cover, with some sampling of Judy Garland. Other songs with a smooth instrumental bent include; The Theme From Schindlers List, Cinema Paradiso Suite, and The Pink Panther. A great feature of this release is that Dave spans the generations. This is not about old movies, new movies, in between movies, it about good music from good movies, of all periods. The vocal tracks shine in a different light. Anita Baker, Vanessa Williams, and Barry Manilow, all work with Mr. Koz seemlessly, and all lend a vocal class to their reads of these songs. Speaking of vocal class my all time favorite, Donna Summer delivers a beautiful, simple, restrained take on A Whole New World. Donna and the artist known for this song, Regina Belle are friends and Regina has covered some of Donna’s material in the past. Here Donna returns the favor, and shows many of today’s vocalists that you do not have to over-sing to be heard. Eight-time GRAMMY® nominee Dave Koz remembers the first record he ever purchased – Tower of Power’s 1974 album, Back To Oakland. It had a powerful impact on him, as his latest album, Summer Horns, shows. Teaming up with three of his most talented and trusted colleagues – Gerald Albright, Richard Elliot and Mindi Abair – Koz revisited the music that made him want to pick up the saxophone in the first place: classic tracks from Tower of Power and other brassy juggernauts that ruled the airwaves from the late 1960s through the ‘70s – bands like Sly & the Family Stone, Earth Wind & Fire, Chicago and Blood Sweat & Tears.